Through previous articles I tried to explain you basic difference between a microprocessor and microntroller; and I also explained 8051 microcontroller – with its basic architecture, pin diagram, memory organization, clock system, reset circuit etc. I hope they have been very useful for your educational purposes. Now in this article, I am focusing on giving you a list of softwares useful for your 8051 development needs. I will begin with a list for free 8051 simulators. A simulator facilitates testing of an application virtually. Here, we can test a circuit application built using 8051 using the simulator, without actually building the hardware. Also you can validate and test your 8051 program using the simulator for the desired output. 1. 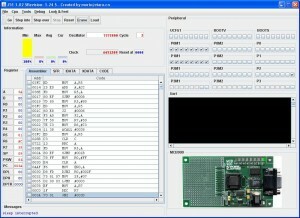 EdSim 51Â – is the most popular and simple simulator available for 8051 microcontroller. EdSim is in fact a virtual 8051 with keyboard, ADC, DAC, 7 Segment display and other external peripherals interfaced. For your info, EdSim isÂ specificallyÂ made for students and their educational purposes. You may not expect professional standards from EdSim. Highlight of this simulator is “simplicity and ease of use”. Any beginner can learn this software pretty quick. 2. HTE – 8051 Simulator – Well, this is a pretty old simulator developed work in the DOSÂ environment. I added this here to the taste of some one who is interested in knowing how it worked on a “DOS -era”. A menu/command driven software which supports all MCS-51 instruction sets. It facilitates interactive programming, which means the change you make to any instruction and its effect can be valuated in real time. This simulator does not support Timers or Interrupts. 3. JSIM – 51 – Â is a free 8051 simulator developed by a frustrated individual who got fed up with the pricing of enterprise simulator softwares for 8051.Its a popular simulator and used by many developers across the globe. A well written documentation is available on the website to understand the simulator and its functioning. 4. BiPom – Unlike other free simulation tools listed above, this one is much more professional in approach. But it comes with a cost! How ever the developers are kind enough to give away an evaluation version for free. You can write 500 lines of C source and 1000 lines of assembly code in this tool. This software is actually an Integrated developmentÂ environment, known as IDE, for the Windows operating system. 5. Pinnacle – is another IDE for 8051 development, which is also a paid software. But you can download a trial version for free of cost. Pinnacle is a microcontroller development environment for all microcontrollers thats uses the MCS-51 architecture. This light weight tool is available for Windows operating system only! 6. IAR – Workbench – They provide evaluation versions for almost all micro controller IDE’s. If you are looking for 8051, you can find it at the bottom of the list. IAR is an enterprise organization which develops software for embedded development. 7. MIDE – IDE – Â A cool IDE for 8051 from Opcube, with assembler, compiler and simulator. They use the free assembler and SDCC free compiler, which makes no code limit. 8. J51 – Â is a java based 8051 (MCS-51) simulator which has an emulator integrated with disassembler, debugger, SDCC symbol table etc. A very decent documentation is available to learn more about the simulator and its usages. 9. gSim 51 – is an open source simulator for 8051, which is completely free to download with source code. You can modify this simulator software for your specific requirement by editing the source code. And it runs on the Linux platform. 10. Rigel – Well, this company Rigel has a set of softwares suitable for 8051 development. Take a look through their list and you can freely choose the one you want. This list is not a complete version. We shall be updating this list with more softwares in future. I would like you to take a look at other software lists we have developed for you. 1. Circuit drawing softwares – a great collection of free, open source and paid softwares suitable for drawing circuit diagrams. 2. Circuit simulation softwares – another collection of free and paid software that’s a well fit for your electronic simulation needs. 3. PCB Layout and Design tools – so as the name says, a collection of tools and softwares for developing printed circuit boards. plz tell us is there pinncal ( 8051 simulator ) present in 64bit. if yes please tell us how to download and for where we download. i use windows10 and want for windows10. It would be nice to mention SDCC (sdcc.sf.net) which includes a simulator uCsim.